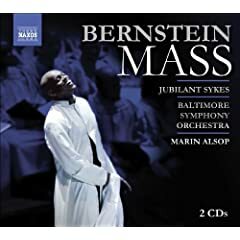 The Baltimore Symphony Orchestra’s recording of Leonard Bernstein’s Mass: A Theatre Piece for Singers, Players and Dancers, conducted by BSO Music Director Marin Alsop, has been nominated for a Grammy Award in the category of “Best Classical Album of the Year.” Released on the Naxos label on August 25, 2009, this two-disc set was only the fourth audio recording ever produced of Mass. It received a second nomination in the category of “Producer of the Year, Classical” for Steven Epstein, who produced the Mass album. Marin Alsop is also the conductor on the recording of Jennifer Higdon’s Percussion Concerto with the London Philharmonic which received a separate nomination in the category of “Best Classical Contemporary Composition.” Winners will be announced at The Grammy Awards event in Los Angeles scheduled for Sunday, January 31, 2010. In recent years, the Baltimore Symphony Orchestra resumed its illustrious recording history under Music Director Marin Alsop. In June 2006, the BSO collaborated with then-Music Director Designate Marin Alsop and violinist Joshua Bell to record John Corigliano's Concerto for Violin and Orchestra, "The Red Violin" released on the Sony/BMG Classical label in September 2007. The BSO and Maestra Alsop have also partnered with the Naxos label to record a three-disc Dvorák symphony cycle. The first disc, which includes Symphony No. 9, "From the New World" and Symphonic Variations, was released in February 2008; subsequent discs will feature symphonies Nos. 6-8. Most recently, the BSO recorded works by George Gershwin with pianist Jean-Yves Thibaudet that will be released on the Decca label in Spring 2010. The Baltimore Symphony Orchestra has won and been nominated for several Grammy Awards over its more than 20-year recording history. The BSO won its first Grammy Award in 1987 for a Sony Classical recording of cello concertos by Barber and Britten with soloist Yo-Yo Ma under the direction of then-Music Director David Zinman. The BSO's release of The New York Album, recorded under the direction of David Zinman and again featuring Yo-Yo Ma, won two Grammy Awards in 1994. The Baltimore Symphony’s extensive discography also includes three recordings released in 1997: a London recording featuring symphonic dance works of Leonard Bernstein; an Erato Disques recording of the piano concertos of George Gershwin and Maurice Ravel, featuring pianist Hélène Grimaud; and a Grammy-nominated London recording of violin concertos by Samuel Barber and William Walton with violinist Joshua Bell. The Orchestra’s last Grammy nomination was in 1999 for its recording of Bernstein's Serenade and Beethoven's Violin Concerto with Baltimore-born violin phenomenon Hilary Hahn as soloist, conducted by David Zinman.